This site serves as a gallery of my artwork depicting caricatures of celebrities and other famous people from movies, TV and music. My gallery is always expanding with new caricatures, so I invite you to come back often. Or better yet, you can sign up for my StarRadar to be notified whenever I post new artwork. 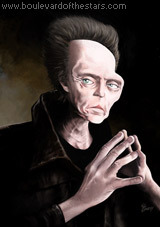 Christopher Walken in a thinking mode. * By entering your email here, you will receive a notice via email when I add a new caricature, or any other major news about this site. I will never share your email with anyone for any purpose. Looking for a caricature artist? I offer top-quality custom caricature work for magazine and newspaper publishers, all kinds of companies and organizations, and individuals. Click here to find out how to request a quote. Copyright © 2005 - 2019 Rok Dovecar. All Rights Reserved. BoulevardOfTheStars.com features celebrity caricatures of famous people from the movies, music, and TV. and exclusive property of Rok Dovecar and may not be reproduced or distributed without written permission from the author.